hello! my skin has been awful recently. whether this is down to a product disagreeing with me or the amount of sweets that have been consumed at work (probably the latter) i’m not sure, but either way it’s been rubbish and my blemishes don’t seem to want to heal! so, although i’ve been trying new products as always, i’ve been really relying on old favourites for days that seem worse than normal. most of my ‘please god sort my skin out’ routine is done at night, when products can really get to work and seem to have more results than daytime treatments. i tend to use a combination of masks, oils and serums to really help my skin when it’s looking awful! masks are a huge part of regulating my skin and i try to use them a few times a week (though late night finishes at work are pushing that to one side, boo!) to do one of three things: deep cleanse, exfoliate or hydrate. for the deep cleansing part, i really like clay or charcoal masks. sanctuary 5 minute thermal detox mask works well for really getting into pores and making skin look fresh and clean, while having a lovely warming feeling as it’s working. if my skin needs a good buff, i’ll reach for merumaya skin brightening exfoliating peel* which is genuinely amazing. i own a fair few exfoliating masks, but i’ve been so impressed by this one, as it makes my skin oh so smooth and radiant looking. as my forehead and cheeks have been dry (for some strange reason) recently, hydrating masks have been helping my makeup not have that dreaded flaky look and making my skin soft. the body shop honey and oat mask is top of my list right now. it smells so nice and genuinely makes a huge difference to my complexion. if i don’t have time for masks, i’ll use a treatment. kiehl’s midnight recovery concentrate is fantastic for a big dose of moisture, as it has the consistency of a serum mixed with a velvety feeling oil. when my skin is looking a bit dull, i’ll use REN resurfacing AHA concentrate to buff away dead skin and leave my skin a bit brighter. underneath most of my treatments, i always try to use hydraluron for an extra boost of moisture. oh and i know it’s not really ‘skincare’ but the aircon has been murdering my lips at work! despite using korres mango lip butter every day, i’ve been obsessed with lush popcorn lip scrub just to keep any chapped parts at bay. 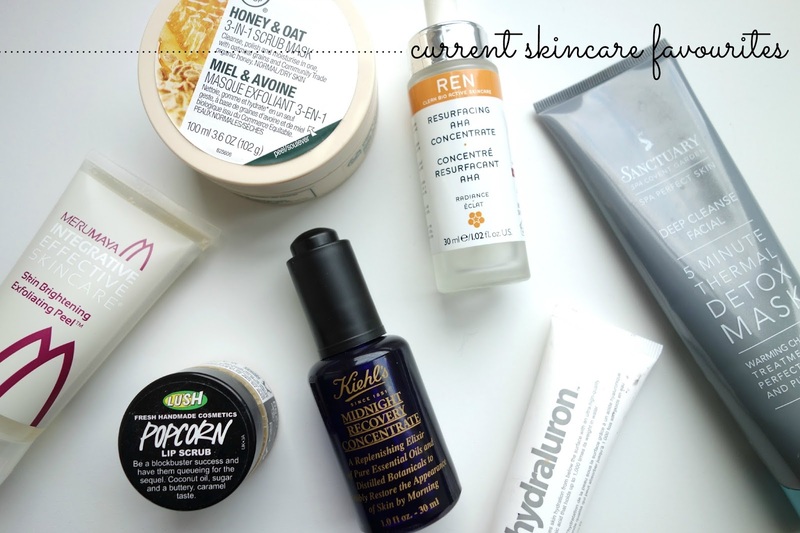 so they’re all of the products i’m loving at the moment! my skin is still a bit rubbish, but it’s slowly but surely getting better (stopping the sweets may have helped too!). what do you use to get your skin back on track? any tips for clearer skin? ps. check out these lovely blogs: maisy meow, pretty eclectic and given me wings!